These cute cookies come from Inside Bru Crew Life. The cookies themselves are not at all sweet, but with the addition of the melted white chocolate and crushed candy canes, you end up with just the right amount of sweetness. 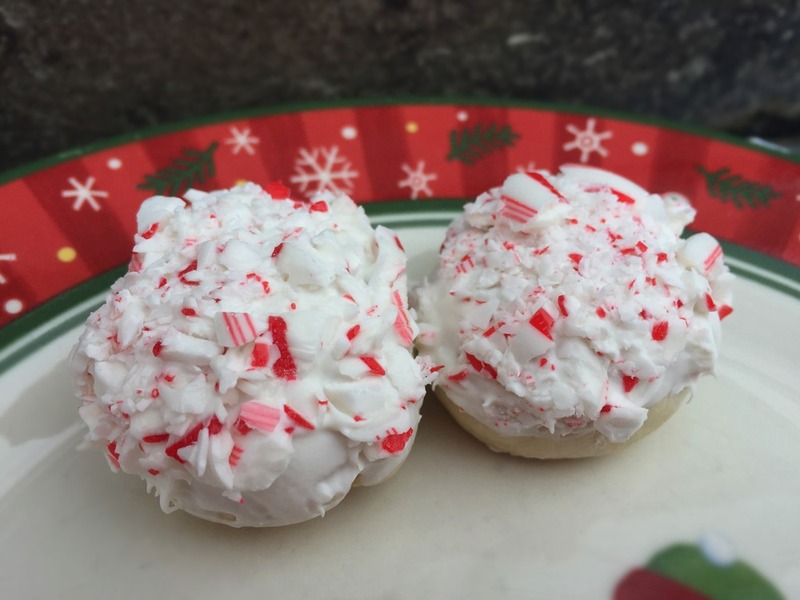 Great cookies for peppermint fans. Preheat oven to 350°F. Grease baking sheets, or use silicone mats. In a large mixing bowl, use an electric mixer to beat butter and sugar until creamy. Beat in egg and peppermint and vanilla extracts. On low speed, beat in flour and salt. Shape dough into 1 inch balls and bake on prepared baking sheets. Bake for 10-12 minutes. Move cookies to a wire rack and cool completely. Place white candy melts in a small microwave safe bowl. Cook on high for 30 seconds; stir. Add 20-30 seconds if not completely melted. Dip the tops of the cookies into the melted chocolate and then roll in crushed candy canes. Place on waxed paper to harden. This is quite the creation. Love!